Blockchain technology since the advent of bitcoin has been evolving in a pace that was almost impossible to guess just a couple of years ago. Lately, there are many new unique blockchains or varieties of projects are showing up with a speed hard enough to keep up with. Everybody seems to want to have a piece of pie but at the same time, plenty of these projects carry a genuine objective of contribution to the blockchain ecosystem. Cryptokitties success using blockchian technolgy added HTML5 for games in the blockchain for the first time, simultaneously created the vacuum and area to be worked on. 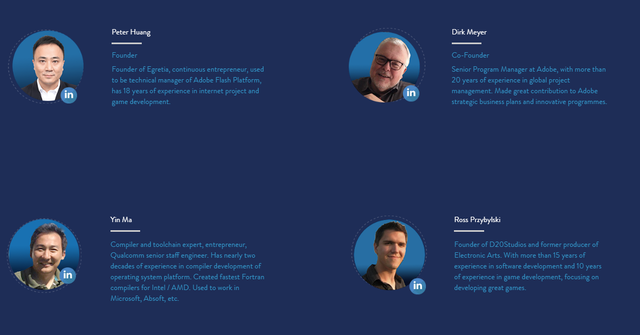 Egretia is one of a start up blockchain project that intends to create a blockchain as a cross- platform solution based on HTML5 technology and establish it as the World's First HTML5 Blockchain Engine and Platform with a vision of bringing 200,000 developers and 1 Billion HTML5 devices to the blockchain world. "This project cooperating with Egret Technology, a globally well-known HTML5 technology service provider, set up Egretia blockchain Lab, combining blockchain with HTML5 technology to create the world’s first HTML5 blockchain engine and platform, aiming for applying blockchain to vertical industries. Bringing Egret Technology's existing 200,000 developers and 1 billion mobile terminal devices into the blockchain world, this project has practical and far-reaching significance". • HTML5, technology is widely used in games,marketing, video, media, Internet, mobile game, video etc. • Currently, users of HTML5 games already account for 47% of all mobile game users. • In 2017, the market size of HTML5 games in China exceeded 10 billion Yuan and showed a growing trend. The domestic revenue of high-quality HTML5 games, has reached 200 million Yuan. • HTML5 technology has been globally recognized as a cross-platform and crossterminal solution with a global market opportunity of 100 billion dollars. • HTML5 Technology has been adopted by many known enterprises like Google, Baidu and Facebook, which, justifies its becoming one of the global technology trends. Egretia integrates the world’s first complete HTML5 workflow being developed for 4 years. The HTML5 workflow includes 14 products, covering a comprehensive suite for HTML5 content development. The HTML5 workflow has reached 200,000+ developers worldwide. The HTML5 content powered by the workflow has covered 1 billion mobile devices. Egretia joins hands with Egret Technology who has spent four years focusing on HTML5 workflow development. This workflow includes over 10 products, has reached more than 200,000 developers worldwide. Furthermore, the content powered by this workflow has covered 1 billion mobile terminals. Egretia integrates Egret’s proven workflow into its blockchain interface layer, thus all HTML5 games have access to the world's first complete blockchain development suite. Furthermore, this interface framework, not only supports Egretia’s own public chain, but also can be extended to support Ethereum, EOS and other public chains in the future. self-developed,efficient public chain based on the Dpos( delegated proof of stake) consensus mechanism, optimized HTML5 through the blockchain interface layer together with Egret engine tools where developers can create blcokchain -based DApps. Egretia is a public chain with high concurrent processing power, where performance is optimized for the needs of the game industry. Egretia can modify the system parameters without bifurcation, Egretia will be able to realize a dynamic adjustment of parameters such as blocksize, output speed, and handling fee through voting method based on consensus. Egretia Blockchain Lab, with core members from Qualcomm, Adobe, Microsoft, etc., as well as experts in blockchain field, is devoted to combining blockchain technology with Egret's leading HTML5 engine and tool technologies, aiming for applying blockchain to vertical industries.